There are times in our lives that we’re faced with trials and tribulations that we must over come, or we’ll ultimately fail and succumb to them. During these times one might find themselves questioning themselves, “Am I strong enough?”, “Am I brave enough?”, “Am I smart enough?”. Some of us may refuse to ask tough questions of ourselves in fear of the answers we may find. We may come down hard on ourselves for past mistakes, trials and judgements passed on us. We may experience negativity regarding the tough decisions we may have made which throw up the unlikeliest of outcomes. Depression, anger or regret may consume us and cripple our will or cause strife within us and hinder our fortitude to continue on. We may find ourselves asking the Gods and Goddesses for help, to aid us or guide us during these times. We may find ourselves being aided by a particular God or Goddess that heeded our call and came to us, perhaps through strength, wisdom, courage, or new life. We hold on to them as they carry us through life’s battlefield. Below their feet, the ones that gave up, the ones that earned a bitter defeat, the ones that gave in to vice, those that failed to press on and march on in life. Did they not call on the Gods? Could they not allow the lessons they teach us to be heard and applied within their lives? Would they not live a Noble or Virtuous life? Regardless of the reason for their defeat, they are all still defeated and you, on the back of a God, gain a sense of pride, of honour, that you are not among the many that lay scattered among the battlefield. You look down at the ground before you, one foot being placed before the other, and then the next, so on and so forth, until you realize, these are not the feet of the Gods, but rather of your own. It is YOU that has been carrying you forward. It is you, with all the lessons learned, all the inspirations you’ve held on too; whether it be the image of a child, or the tender touch of a loved one, or the chance to see another sunrise or sunset, or to feel Sunna’s rays shining on your face. Whatever your drive, whatever your reason, you have pressed on, and you will continue too, for giving up isn’t an option for you; “giving up” isn’t even in your vocabulary. You’ve made it this far, you aren’t about to fall to defeat now, for you’re no longer on the backs of Gods – you ARE a God within your own right, and you are NOT alone. 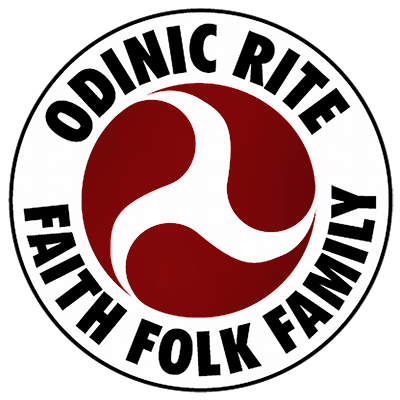 There are many like you, standing with you, in Folk, in Faith, in Family, for WE are the Odinic Rite, and we WILL win the many battles life brings our way. Hail to all our brothers & sisters, whether you are living, be it between concrete walls or in the free world, you will press on, you will be victorious… Hail to you all!!! !